Hi All, sorry I messed up the username requirements yesterday. I was curious to know what era this is, how are you able to identify a manufacturers date? The fan did not come with a guard, I ended up sourcing one off of ebay. Whats the best way to strip paint and rust, a sand blaster, a wire wheel, hand sanding... If I do use a blaster is soda or sand a better idea. Any recommendations for paint? With regards to the GE medallion, how do you achieve the two color look black/brass? I noticed that the motor case screws are brass but the blades have a coat of silver paint, do you suspect the fan blades are steel? If so is there a brass paint that looks authentic? Or maybe ill leave it Steele. The parts I mentioned earlier that are red, what are they meant to be? Metal I assume, but steel or brass? Where might I source those? Added images to the post now too. Here is an identical fan to yours other than mine was a 12" and yours is a 16". 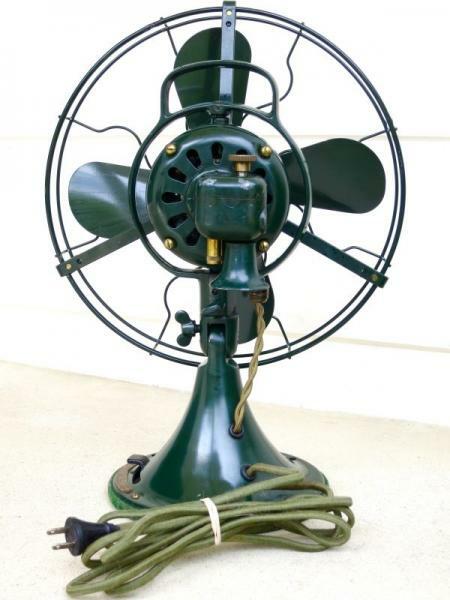 The finish and cords and plug on my fan are all original and the fan is in excellent, "minty" condition, and completely unrestored. Unless you love to restore you might want to consider abandoning your fan as the work it will take will be more than it is or could be worth. But, if you love the challenge then do fix it up or restore it. The rear castings on the motor I do not recognize as being GE so someone has modified the fan in that area. Your blades should be aluminum and would have been painted green. Hope this helps. Steve, I think the end bell has what is left of the gearbox attached to it. Kim Frank wrote: Steve, I think the end bell has what is left of the gearbox attached to it. That must be Kim but it stretches my imagination on how it got the way it is. Probably the outer walls of the gearbox were removed. More than likely the fan took a spill at some point in time and the gearbox, being made of potmetal probbly broke off the back of the fan. Is it just a shroud thats missing, or does it provide some other function? What is the knob on top of the shroud for, that part is missing on mine? Is the fact that my (not sure what to call them) are red, meant they've been replaced, or dis some get plastic ones? It kind of oscillates. It gets to one side (clockwise) and kinda goes the other direction and quits. Eric Krispin wrote: Is it just a shroud thats missing, or does it provide some other function? What is the knob on top of the shroud for, that part is missing on mine? Your are missing the guard (shroud) and the struts that hold them to the motor as well as the specially threaded screws and guard clips. I don't know what knob on top of the shroud you are talking about. I don't see one and there is not a knob on top of the shroud. Your fan is completely missing the oscillator parts of the gearbox. It must have broken, and the owner cut it out and finished it to look nice. They also cut the end of the shaft of with the worm, so you will need a new shaft or rotor and gearbox if you want to fix it. Right now it will just move around from side to side freely unless tied down, it isn't actually oscillating. The red things are oilers and should be a brass. They unscrew like a regular thread. Remove them and clean them and add 3 in 1 electric motor oil in the blue can in them to prolong the fan's life, don't use regular 3 in 1 with the red/black bottle. Ok, so finding the missing parts I need are probably going to be cost prohibitive... But Im ok with it being a stationary fan, the 3-speeds work, and im cool admiring it for what is. That being said, what should/do I need to do to keep it running. I.E. preventative maintenance. Eric Krispin wrote: Ok, so finding the missing parts I need are probably going to be cost prohibitive... But Im ok with it being a stationary fan, the 3-speeds work, and im cool admiring it for what is. For me, it would be just to pull the oil cups, clean them out, replace the wicks, and add a good lightweight non detergent oil like zoom spout or 3 in 1 (blue can). You could open it up and give it a good vacuuming too but if you do take lots of step by step pictures - especially if you’re like me and not very mechanically oriented. Add fresh oil each season (or more frequent if use it often) and it’ll probably outlast anything new that’s out there. There are lots of other things you could but that’s what I’d start with. Good luck! Page processed in 0.1811 seconds (20% database + 80% PHP). 30 queries executed.